iTunes Match has entered the public arena (for the U.S., at least), and it’s brought along a rush of questions. Never fear: Macworld is here to help make sense of it all. Here are some of the most common queries, concerns, and misconceptions about Apple’s music service, laid out for your reading pleasure. iTunes Match is part of Apple’s iCloud and iTunes in the Cloud initiative (although you do not need an iCloud account to sign up, only an Apple ID associated with iTunes). For $25 a year, the service does two things: match and upload your music library to a central server, and let you download (or stream, if you’re on a computer) those items to devices you own. The service works by scanning your library and matching as many tracks as it can with songs from iTunes’s 20 million song catalog. If iTunes can’t find a match, it will upload those unmatched tracks to its central server so that you can stream or download them to other devices associated with your Apple ID. This benefits you in two ways: You don’t have to manually upload every song in your catalog, and—for songs that iTunes matches with its catalog—you can re-download high-quality versions of them for free. As such, if you have a poorly-encoded (or Digital Rights Management-encumbered) copy of a song you own or have authorization for—and that song exists in iTunes’s 20 million song catalog—you can re-download those tracks as 256-kbps DRM-free AAC files. iTunes Match will provide this service for up to 25,000 tracks not originally purchased with your Apple ID; if you have more than that, you’re currently unable to sign up for the service without employing a trick or two. Since iTunes Match is not directly associated with iCloud, it uses separate storage for all those tracks you upload. Those storage costs are certainly part of it; we’d also venture to guess that Apple has worked out a deal with record companies in regards to letting you re-download iTunes-encoded copies of your music (even if you didn’t originally purchase them from the iTunes Store). Most likely, this $25 fee helps cover that deal, and lets you upgrade tracks you’ve ripped or received from other sources. Anyone with an Apple ID in the United States. That latter limitation is likely due to music licensing restrictions. When is it coming to other countries? We’re not sure. At the Worldwide Developer’s Conference in June, Apple noted that the company hoped to roll it out internationally by the end of the year; that date hasn’t been restated firmly, however, probably as a result of pending licensing deals. Right now, we’re afraid that international users will just have to wait patiently. Does the Apple ID I use for iTunes Match have to be an iCloud account? Nope! If you’ve been using a separate Apple ID for purchases, that Apple ID will work just fine for iTunes Match. How many devices can I use iTunes Match with? Apple says that access to some services (uploading and matching libraries, streaming music) is limited to 10 devices. This includes computers, iPhones, iPod touches, iPads, and Apple TVs. Restricted to one: You can't double-dip an iTunes library for two different Match accounts--not unless you want to wait 90 days. Can my significant other and I have two separate iTunes Match accounts for one library? Unfortunately, no. Due to what we suspect is a record company restriction, your computer can only be associated with one Apple ID for iTunes Match and Past Purchases. If you want to change it to another Apple ID, you’ll be able to do so—but after you switch, you won’t be able to change it back for 90 days. In theory, this prevents you from logging in to your friend’s iTunes Match account on your computer, downloading all his music, then swapping back to your own. In actuality, it makes it a tad difficult for families who share an iTunes library, but not an Apple ID. To get around this, we’d suggest either making separate user accounts on your computer, each with their own library, or option-clicking iTunes and creating a new library for each member of the family. How do I turn iTunes Match on? On an iOS device, head to Settings -> Music -> Turn On iTunes Match. On a Mac, open iTunes and click the Store menu, then click Turn On iTunes Match. On an Apple TV, go to Music -> iCloud Library. Sign up success: After matching and uploading, you'll see this message in iTunes. What kinds of content can iTunes Match upload or match? You can match or upload any music format that’s compatible with iTunes. That includes AAC, Protected (DRM) AAC (.m4p), MP3, WAV, AIFF, Apple Lossless, and more. You can also re-download music videos from the iTunes Store that you originally purchased, but the service will not match video content, nor any other iTunes file types (PDF booklets, Voice Memos). According to a support document Apple released, you also won’t be able to match or upload certain types of Music files: files over 200MB, DRM-encumbered tracks that you aren’t authorized to play, DRM-encoded songs purchased from an iTunes Store other than the U.S. version, and any music encoded at less than 96kbps. You can fool iTunes Match on that last one, however, if you create an AAC version of the song within iTunes (Advanced -> Create AAC Version), and then attempt to match that version. What criteria does iTunes Match use to scan my library? We’re not entirely sure, as Apple’s kept the exact formula close to its chest. Most likely, it’s a combination of ID3 tags and scanning the actual content of the track (and, for all we know, a blood sacrifice and a full moon). What’s the difference between Matching and Uploading? If a song of yours returns as Matched, this means that iTunes has a high-quality version available in its track catalog, and you won’t have to upload your current version. It won’t automatically delete your current, low-quality file; instead, to replace it you’ll need to delete your current file from your library and re-download. Uploaded songs are tracks that iTunes Match has not been able to reconcile with its catalog. Instead, the service will upload that track, as-is, to its server for playback. 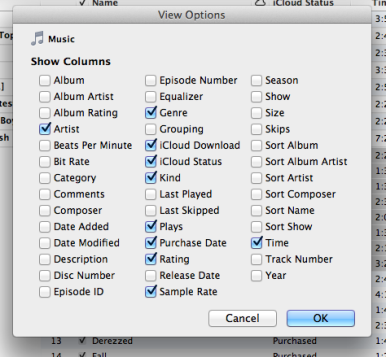 View the iCloud: Check off iCloud Download and iCloud Status to see how your tracks have been labeled by iTunes Match. How can I tell which songs have been Matched? Uploaded? Downloaded? Where are my uploaded Match songs stored? As part of your $25-per-year subscription, iTunes Match stores uploaded songs in a central server; when you want to play back or download them, that data is re-downloaded locally to your device. This storage is not associated with your iCloud account. Does this replace iTunes Plus? If you sign up for iTunes Match, yes! Previously, users who wished to free their older purchased music from its DRM shackles would have to pay a 30-cents-a-track upgrade fee, as part of Apple’s iTunes Plus service. With iTunes Match, however, that option goes away from the iTunes Store, and you can match any DRM-laced track you’re authorized to play, replacing it with a DRM-free 256kbps version. For those who don’t want to sign up for iTunes Match, you can still use iTunes Plus to convert your tracks for 30 cents a piece. My family has several Apple IDs we’ve used for our music. Will iTunes Match let us upload other users’ DRM-protected files? If you’re authorized to play the file, yes! Read more about unifying your music in our post on the matter. Will Apple know if my music has been illegally downloaded when it matches it? Will the company tell the record companies? Good question. We don’t know—and we’ve put in a question to Apple about it—but honestly, it doesn’t seem likely. For one thing, it may be a privacy violation; if not, it seems like a bad business move to set up a music service to use as a piracy fishery. Until we find out otherwise, it’s likely that part of that $25 subscription fee is going toward placating the record companies on such a matter. Of course, if you’re really concerned about this, you can do one of two things: Don’t use iTunes Match at all, or replace your songs with iTunes-encoded AAC versions. The latter (done by highlighting the track(s) in question and going to Advanced -> Create AAC Version) will convert your track into an iTunes-encoded AAC file—just like it would if you ripped it from a CD—and presumably strip it of any naughty identifiers. iTunes says it’s matched tracks of mine that it doesn’t have in the iTunes Store. What’s up with that? It’s true that iTunes Match is offering matched tracks for artists it doesn’t officially sell in its catalog—AC/DC among them. This may come down to licensing: It’s possible that record companies and certain artists may be OK with users upgrading their already-owned CD collection, but they don’t want to sell digital music. We’ve put in a request for comment from Apple on the matter. Even though they aren't on the iTunes Store, some songs can still be matched and replaced with high-quality iTunes AAC files. How do I replace my Matched low-quality tracks with iTunes 256kbps AAC tracks? If I delete a file from iTunes in order to download the higher-quality version from iTunes Match, does iTunes remember my metadata—ratings, play counts, custom tags, and the like—when the new version is added? It does. Cooler still, if you play a song from your Match library on your iPhone, then view the song in iTunes on your Mac, the play count will automatically increase. I currently use the iTunes setting to sync low-bit-rate versions of my tracks to my iPhone to save space. Is there a way to download low-quality versions of Matched tracks to my iPhone? Not at this time, though you can pre-load your device with low-bit-rate versions of those songs from iTunes. Some of my uploaded tracks are in other formats (Lossless/AIFF/WAV). What happens if I try to download these to other computers, or my iOS device, via iTunes Match? We’ve had conflicting reports here. Apple’s official position is that any song encoded in Lossless, AIFF, or WAV will be uploaded as a 256kbps AAC file to the cloud. Macworld’s Christopher Breen, however, has not found that to be the case: He was able to upload AIFF and WAV files to iTunes Match and re-download it in the original format, no AAC version to be found. He’s investigating further, and we’ll let you know. So, wait. Do my iTunes Match songs stream, or download? On a Mac, any cloud-stored songs will (by default) stream over the air when played, though you can download them at any time by clicking the iCloud download button. On an iOS device, though, you’re required to download the track in full—possibly so that you’ll be able to listen to that song even if your network connection shorts out. Your track will start to play before it finishes downloading, so you’ll be able to listen to any track you pick almost immediately. Apple TVs only have the option to stream songs, as they don’t have any storage capability. I downloaded a song to play on my iOS device, but now I don't want it anymore. How do I get rid of it? Open up the Music app, find the offending song, and swipe to delete it. Will iTunes Match songs download over 3G on my iOS device? They will, but only if you allow them to. Navigate to Settings -> Store on your device. The Use Cellular Data switch will enable you to download content over 3G; turn it off if you’d rather download over Wi-Fi. Can I tell iTunes Match not to sync certain songs? Yes, but it’s a bit complicated. Take it away: Don't let that song you downloaded for karaoke that one time stay on iTunes Match--hide it from view. If you don’t want iTunes Match to display certain purchased tracks (say, you downloaded a Spice Girls album in your young and impressionable youth), head to the iTunes Store on your Mac and click the Purchased link in the right sidebar. Hover over the tracks in question and click the X button to hide them. You can do this on your iOS device by going to the iTunes app and tapping Purchased, then swiping on a track to hide it. To view hidden tracks, go to the iTunes Store on your Mac, click on your email address, and scroll down to View Hidden Purchases.